I was home for a short time to do Wedding Preparations and see family, and I brought two decks, in the off chance that my brother would be around to play. Of course I had to play the Legendary Wedding deck. Playing with my brother is fun, because neither of us take the game too seriously. I started with a 4 land hand and played a Mikaeus the Lunarch with 1 counter on turn two. Teneb started ramping early on with Fertilid and a Solemn Simulacrum. I played Heliod and a Day of Destiny, and swung with Mikeaus, who was functionally a 5/5 at the time. He was swords, but I tapped him to pump for 6 life. I dropped a Kor Haven, and I needed to keep mana available for it because Teneb had hit the board adn was threatening. Teneb continued to ramp, using a Whip of Erebos to bring back Fertilid and use it twice. I was able to play Brigid, Hero of Kinsbaile and attack. Teneb ramped into It that Betrays. I, against better judgment, Expedition Mapped for Cathedral of Serra (because that’s how this deck rolls — Bands. With. Other. (I should’ve probably gotten Nykthos, Shrine to Nyx (my proxy is “Nicthos, Shrine to Nics” with my face with the ‘starfield’ effect))). I banded Heliod and Brigid and was able to kill Teneb, though I was hoping to get ITB to block. I was stuck at 4 useable land. My brother isn’t very cutthroat, and could have won the game right there with annhilate and ITB, though I did have enough Cleric tokens to survive for a turn. Instead he built up Liliana of the Dark realms to her ultimate (because he didn’t have enough mana). I lucked into an Akroma’s Memorial (which he decided not to destroy, opting to kill the Kor Haven instead). Teneb then cast Diabolic Revelation for 15, followed by a Morality Shift into Rise of the Dark Realms (leaving him with 5 or 6 cards in his library). If we would have taken time to deal with all of the Triggers (I later noticed a Terastodon) and such, he probably would have won, also. I was dead, and couldn’t think of what I could draw to not die on his turn. I drew Honor-Worn Shaku, and started formulating a plan. The Shaku allowed me to play and use a Mindslaver, the sacrifice of which put it on to Teneb’s side via ITB. He was tapped out. All I had to do was figure out how to get him to draw out his deck. I took my stolen turn, first re-using the Mindslaver to get control of his next turn. He had Chainer, Night-Eyes and the Whip of Erebos for reanimation, but NO SACRIFICE OUTLETS. My plan was to use his Solemn Simulacrum and Pelakka Wurm death triggers to cause him to draw out. I had plenty of ways and means to get them back, but the only way I could kill them was via one Avatar of Woe (I did re-draw his STP and exile his Platinum Angel). I killed the Pelakka Wurm and reanimated it. He was down to 3 cards in the library. I took my second turn. Drew. 2 cards. Killed the Pelakka Wurm and reanimated it. 1 card. Then I noticed Mageta the Lion. I had two cards in hand so I wrathed the board. 2 draw triggers… only one card to draw. (we weren’t sure how the triggers would work with creatures reanimated by Chainer, so we agreed that I had just used Nighteyes). It was a silly game, and my brother really should have won it, but he said he was far happier getting to Morality Shift/Rise of the Dark Realms and then watch me try to make him lose. I wanted another Mono-White deck, as I had the fewest mono decks of that color, and I was intrigued by the old non-mana-producing lands from Legends that granted “Bands with Other Legends,” mostly because people think they are terrible. It became clear that a Mono-Legendary deck was in order. Since I’m getting married pretty soon, AND I loved “How I Met Your Mother” (and I didn’t hate the 9th season OR the finale), I knew it had to be somewhat Wedding Themed. Yomiji is the officiant, and there are an equal number of “male” and “female” legends (because my wedding will be of that variety), though neither I, nor the deck discriminates, and good gameplay allows any legend to freely “Band” with any other legend (“Cats and Birds! Living together! Mass Hysteria!”), including Sister Wives and Brother Husbands, etc. Most of the non creatures are also Legendary, though there are a few cards like Ring of Thune, Holy Day, etc. I was extremely excited when Heroes Podium was spoiled, because it was the perfect Altar for the wedding. At the beginning of your end-step put a counter on Lun Ring. If Lun ring would have 4 or more counters on it, instead remove all counters. Add 1 to your mana pool for each counter on Lun Ring. It’s a counterpart to Sol Ring, also based off of Tidal Influence. It’s probably broken. I’m not a developer. No one else showed up last Wednesday to the regular EDH night at my store (or at least not for the 40 minutes I waited) and I won’t get a chance to play this week, so I thought I’d share a bit about new decks that I’m working on. Last Wednesday was going to be the debut of two decks (for which I do not have full lists written up). 1. Soramaro, First to Dream, which is a “creatureless” deck built to draw a ton of cards and make Soramaro huge and voltron-y, with a back up plan of Altar of Dementia and a bit of mill. In an ideal world (or one that plays Tag-Team commanders) this would be a UG deck sharing space with Masumaro. 2. Vhati il-Dal: This deck was one that just sort of happened. It is a -1/-1 counters matter deck, meant to use counters to my advantage and to kill off Vhati-ed creatures. It has some Devoted Druid/Quillspike combo action, and hopes to use Nekroskitter for benefit. I’ve wanted to do a Vhati deck for awhile, but didn’t really have a theme for it. I considered using Infect, but since I dislike Poison so much, I cut most of that out of the deck. There are one or two infect creatures, but they are there more because they interact with -1/-1 counters. 3. I also may have played my “White Wedding” deck (Yomiji Who Bars the Way), which is all Legendary creatures (and almost all Legendary Permanents) and focuses around giving them (wedding)-Bands with Other White Legends at the Cathedral of Serra. There are an even number of “male’ and “female” legends, of most humanoid species, (but they are allowed to Band with Other Legends of any species or gender… Yomiji believes in Marriage Equality). I even have a special box for it, and little gold ring and dove tokens. A. The Green Legends deck (a rotating cast of green legendary generals including Reki, Kaysa, and others): I liked building the “White Wedding” deck (all white legends) so much that I decided to build a Green one (and might eventually go for each color) to give some Legendary Creatures that don’t fit into other decks, or might never lead a deck, the chance to play. I intentionally did green second (and separate from white) to show that I know it’s “Better” to just use Sisay. B. Kruphix: The green legends deck was originally going to be a Masumaro deck (but not a ‘creatureless’ one, possibly an all-creature one) but then I realized it would be fun to have both Masumaro and Soramaro (and Multani) in the same deck. I thought about Edric. Then Kruphix was spoiled. Of course I want an indestructible Reliquary Tower as my general for a deck like this. I’m excited to build it. I may use Enter the Infiinite as a win condition (just to buff the ‘Maros. no Omniscience in the deck). C. Skeleton Ship: I’m very close to my “Pirate” theme deck being done. I may tweak it a bit to make it even more “Pirates of Dark Water” themed. The challenge is taking the time to find the best 15 islands (preferably foreign) for the deck (possibly shelling out for APAC and European lands). Athreos is finally spoiled. It’s not what I hoped for to help Teysa #1, but I could see myself building a B/W weenie devotion deck with it maybe with minor life-gain and Carnival of Souls. This was the very first time I even did test draws with this deck (which meant I had to reshuffle twice before I got a hand with any land). My hand had decent lands, but not decent color distribution. Sisters of Stone Death played an Urborg, Balthor a Deserted Temple and some kind of tutor. I drew a Demonic Collusion and was pretty pumped. I hit land drops and mana rocks and was ready to cast it on turn 4, pitching two decent creatures for Buyback to search out a Prince of Thralls, and then cast it again the next turn pitching the Prince and another good creature. At this point I had both Cold Storage and Voyager Staff in hand, so I grabbed Salvaging Station, all set to cast Sedris next turn and start playing Unearth tricks. Then Balthor cast Withered Wretch and a Candelabra of Tawnos and had ninety bajillion mana and a Grey Merchant and Geth and all sorts of silly things. A Memory Jar actually helps me a bit, putting some unneeded lands and big fatties in the grave yard, but there wasn’t much we could do. Sisters cast the Join Forces ramp spell and I got a bunch of lands. I cast Life’s Finale, helping Sisters get Massacre Wurm, RuneScarred Demon and Hythonia, in his yard for impending Balthor activations, but Balthor just cast Yawgmoth’s Will and re-cast his graveyard instead using Pontiff of Blight to Extort Sisters to a stone death and me to 3. On my turn I cast Sedris, unearthed a Dead-eye Navigator and blinked it, just because. Then I died. The deck did what I wanted it to in terms of draws, spells and graveyard. Withered Wretch was just too good. This deck started as being a UBR Zombies deck using cast-offs from building Tymaret and adding blue, until I remembered that I already had one of those in Lord of Tresserhorn. So it became more of a load up my graveyard/your graveyards unearth/reanimate deck. It’s different enough from my Mimeoplasm deck to be fun. I don’t usually like self-milling, but it’s fun in this deck. As big finishers I like Dragon Tyrant and Prince of Thralls. We started the night playing Mono Black (Balthor vs. Nefarox vs. Shauku the Endbringer). I had some decent Cleric animation and reanimation and was poised to do pretty decently, but Shauku (a creaturless deck) was able to hang on and use Sanguine Bond and the gain-life Tower to kill us off. After Sedris I played Melek, Izzet spell-copier guy vs. Balthor and Sisters. My happy play in that game was to double cast a Stolen Identity (getting a matched set of Caged Suns) AND a drake and elemental token. I don’t remember who won that one. I ended the night playing Teysa #1 against Balthor and Karona. Karona did laps of the table but mostly pounded herself and Balthor. 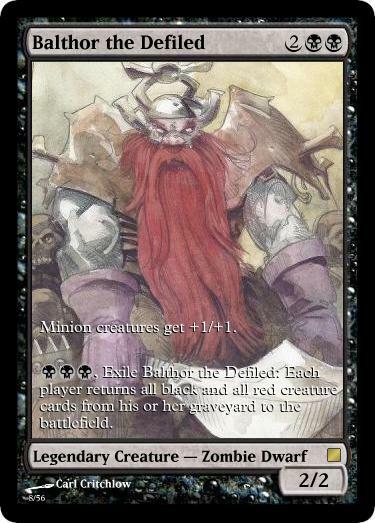 Balthor didn’t have a great board or graveyard, and I had a pretty decent selection of card draw, token creation, sac-outlets, mana and reanimation, so Balthor scooped for time.